For roughly 8 months of the year, those of us here in Minnesota live in deep freeze, so bugs are not an issue. 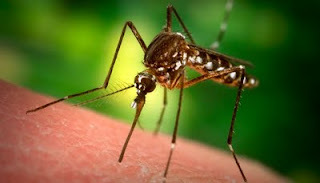 Once our lakes thaw however, it is but a matter of time until our unofficial state bird reappears, the mosquito. Stuck inside, trying not to loose digits to frostbite for more than half the year, we are not about to let a few bug bites get in our way of enjoying the amazing MN summer. So, we all get to know bug spray pretty well from June to October. There has been much concern of late about West Nile Virus and Lyme's Disease, but also DEET and other insecticides, so what to do? I have two young children and the idea of dipping them in DEET scares me. I am not usually a worrier when it comes to things that are "bad" for me (been carrying a tiny bottle of 100% DEET in my daypack for years), but my kids are different for some reason. The "All Natural", "Botanical" and "Chemical Free" labels on products have historically meant citronella in a spray bottle and work about as well as wearing nothing at all. Enter 45ºN 68ºW and their Natural Insect Repellent. Made completely from pharmaceutical grade botanical oils like Neem and Lemon Eucalyptus Oil, it is 100% safe and still protects us from potential diseases spread by insect bites. I was not loaded with confidence when these arrived. With the never ending winter of 2010-2011, it wasn't until June that I even had a reason to pull them out of the closet. The smell test was not very reassuring. I would even go so far as to say it smelled good. Bug dope can't smell good and work, right? Apparently it can... I wore this stuff for 5 days in the BWCA, the Mecca for mosquitoes and horse flies, and it worked amazingly well. After an afternoon swim I needed to reapply so I ran a little head to head test against the good old 35% DEET spray. One arm in each. It was too close to call, a dead heat. It lasted for hours and it seemed to hold up to sweat pretty well. DEET and other chemical sprays are known to discolor and eat several materials. I sprayed a few different items; canvas, nylon, cotton and vinyl and none were adversely effected by the 45ºN 68ºW spray.